BARNFEST returns to the Big Red Barn this year on August 25th, with headliners Slipton Fell and featuring dbdb and many more performers! Only $10! (pre-sale, $12 at the door). Pack your cooler, bring your lawn chair and be prepared to have a great time! We’ll also have food available for purchase as well. Starts at 4pm. 6525 Rts 5 & 20. •Can I bring a cooler? YES! We’ll have hot dogs, drinks, chips and dessert are available for sale, but feel free to pack a cooler with your own beverages and food. •Is this event family friendly? YES! Bring the kids! •Can I use the pool? NOPE. Sorry. The pool will be off limits during Barnfest. There is a swing set that kids are welcome to play on under your supervision, and we’ll have some lawn games set up. •Where do I park? Barnfest parking is in the mowed grass lot directly across The Outdoor Store. Senior and handicapped parking in the driveway and around the back of the barn. If you’re staying till the end you might want a flashlight to find your car. 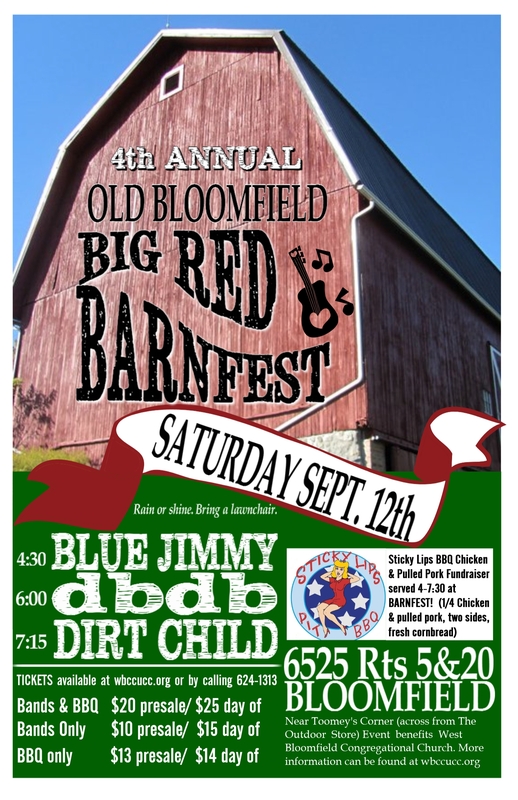 Join us for the 4th annual BARNFEST music event to benefit West Bloomfield UCC. This year Sticky Lips BBQ will be available!Saturday September 12th. Music starts at 4:30. We have Blue Jimmy, West Bloomfield UCC’s house band dbdb, and Dirt Child lined up to perform. Sticky Lips served 4-7:30. Additional refreshments and drinks will be available for purchase, and you are welcome to pack a picnic as well. Bring a lawn chair and your dancing shoes! Situated on 50 beautiful pastural acres (that you are welcome to explore) in charming Bloomfield, this is a family fun event! 6525 Routes 5 & 20 in Bloomfield, across the street from the Outdoor Store. Parking is in a grass lot with a short walk to the barn. There is a drop off available for those that need assistance. 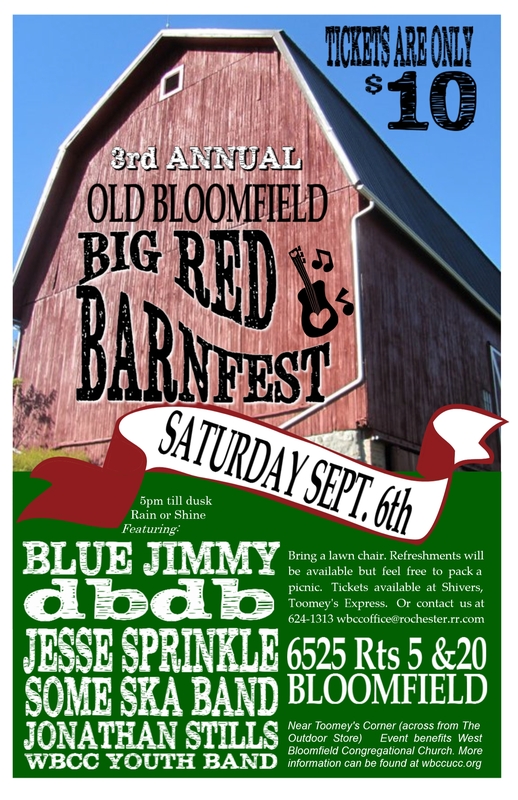 3rd Annual Big Red BARNFEST! DIFFERENT AND EVEN BETTER THIS YEAR! More mowed and smooth parking. Handicap parking close to bands. Better steps between barn and food tent. Some Ska is an exciting new band to this neck of the woods. Jonathan Stills is an exciting young artist with his street cred from American Idol. Plus all of our fabulous returnees! On Sunday, June 8th, dbdb releases it’s third CD (and first in seven years! ), Awakening. This latest work features a loosely unified theme and an unusual cast of characters: A paranoid executive digs a pit in his backyard. A religious fundamentalist realizes his friends are running away from him. A bruised and weary woman finds her voice and her freedom in the pouring rain. A mortified hothead tries to turn the clock back 24 hours. Members of the band and the few fans in-the-know are calling Awakening dbdb’s best effort yet. The release is dbdb’s first to be available for download on iTunes and Amazon. In another first, the CD includes a link to a companion manifesto, complete with lyrics, photos, and background on the writing of each song. MARK YOUR CALENDARS! 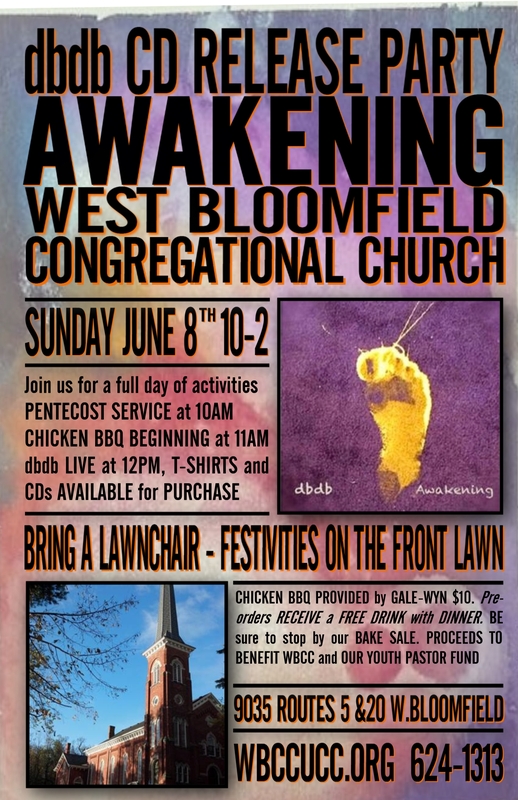 West Bloomfield Congregational Church will be celebrating the release of their house band’s 3rd album “Awakening” on Sunday June 8th from 10 a.m. ’til 2 pm. 11am Chicken BBQ begins/ Bounce House for kids/ yard games, etc. 12pm dbdb (our popular house band) plans to perform the CD live in its entirety on the church’s front yard (so bring your own lawn chairs). dbdb T-shirts will be $15, CDs will be $10. Or you can buy a CD/T-shirt-combo for $20. dbdb believes all good music is spiritual, and take it upon themselves to crack open minds, expand outlooks, and rock whatever joint they ride into. Two CD releases include The Places I Have Been (2004, soldout) and Untraditional: What Would Jesus Dig? (2007) Their third album Awakening will be released Sunday June 8, 2014.
dbdb can be found rocking West Bloomfield UCC every third Sunday of the month, and playing occasional festivals and gatherings around New York state. They are guitar based, with a focus on tight harmonies and strong percussion. West Bloomfield Congregational Church is located at 9035 Rts 5 & 20.